On our Blade product pages we provide you with approximate dimensions of the blades, so we wanted to show you where we take our measurements. When we take our measurements of the blade head, we only take into account the “playing” are of the blade, that is the area that is covered by the rubber. 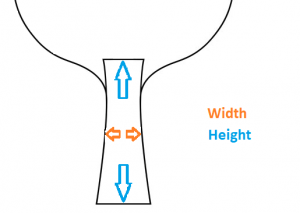 In addition to the measurements shown on the diagram below, we also measure the circumference of the handle to give you an ideal of how thick the handle is. 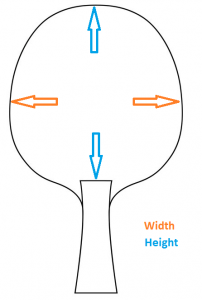 This is measured at the same point as the width shown on the diagram irrespective of the handle shape; this is so that we can a) be consistent b) give values that are comparable no matter what blade you are considering.